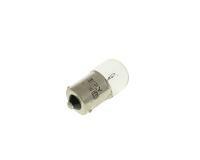 12V/10W indicator bulb, clear for BA15S base. Can also be used as number plate lights, side lights, reading lights, rear lights and braking / fog lights. Please check product photo to be sure.